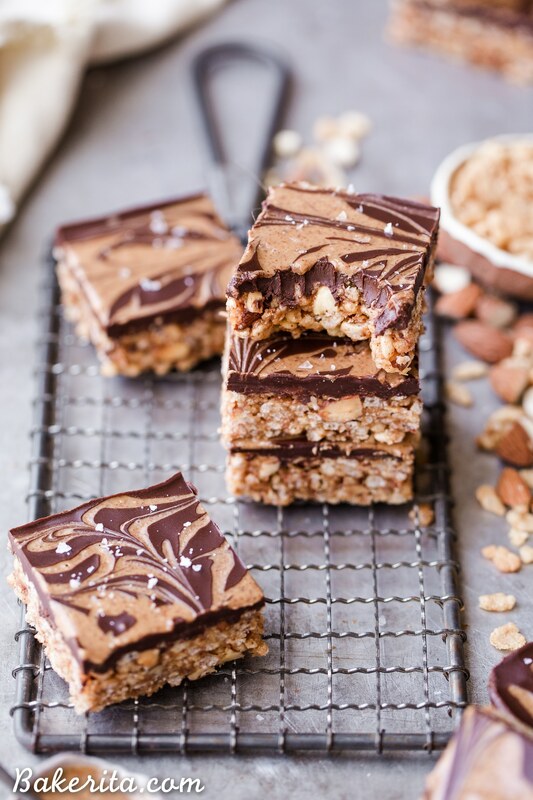 These Chocolate Almond Butter Crispy Bars are crunchy, rich, and absolutely delicious! There is no baking necessary so they’re super quick and simple to make with only 7 ingredients. I’ve got a sweet and simple recipe for ya here today! It looks a lot more beautiful and difficult to make than it actually is though…aren’t those swirls the best?! And though they look super nice…they taste even BETTER! 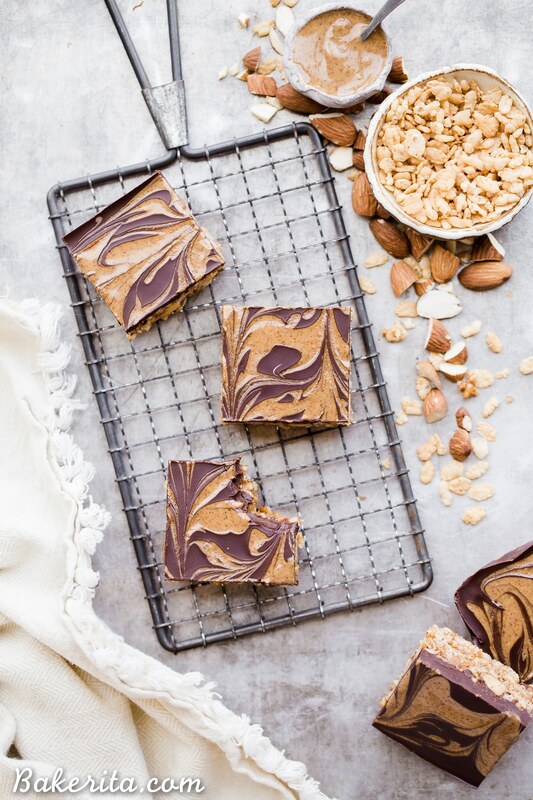 I had to hide these in the freezer because I’m bringing them to my sister in San Francisco and I need to make sure there’s actually some left for her to enjoy :) they were based off my recipe for these Chocolate Peanut Butter Crispy Bars. But I think this version might be even more delicious. Even though if I DID eat them all, they’re simple enough for her to make herself too. Let’s get into how it’s done. 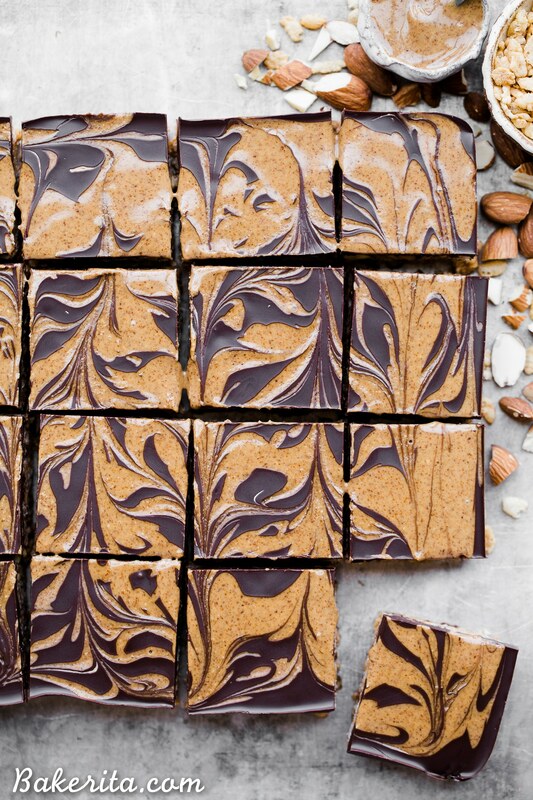 Let’s make Chocolate Almond Butter Crispy Bars. First up, the dry ingredients are VERY simple: there’s just two. Brown rice cereal and roasted, chopped almonds. Those are tossed in a bowl, while the liquid ingredients are combined in a small saucepan. We let the almond butter, maple syrup, and coconut oil come to a simmer and let it bubble for three minutes – this helps the sugars caramelize a bit which will help the bars hold together well. We drizzle the liquid gold all over the cereal and almonds and then toss it together until it’s all combined. Press it into the pan and that’s all – we could stop here, but where’s the fun in that? Time to add some CHOCOLATE! We combine dark chocolate and almond butter for an easy, fudgy topping, and then add MORE almond butter to swirl into that. I think the swirl just makes everything look so pretty. If desired, sprinkle a bit of flaky sea salt over the bars…and then place them into the fridge or freezer to set! They take maybe 10 or 15 minutes to put together, and they’re so scrumptious. The chocolate fudge layer paired with the crunchy, crispy bottom layer is irresistible! Hope you love these as much as I do :) enjoy, my beautiful friend! 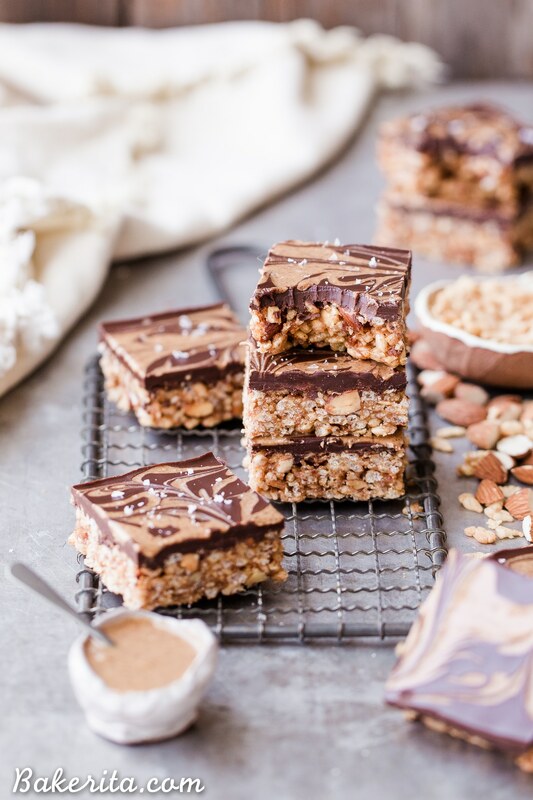 These Chocolate Almond Butter Crispy Bars are crunchy, rich, and absolutely delicious! There is no baking necessary so they're super quick and simple to make with only 7 ingredients. Place the puffed brown rice cereal and chopped almonds in a large mixing bowl. In a small saucepan, combine the almond butter, maple syrup, coconut oil, and salt if using, over medium-low heat. Whisk to incorporate and melt the coconut oil, and then bring to a boil. Turn down to a simmer and let bubble for 3 minutes, whisking the whole time. After 3 minutes, remove from the heat and pour over the brown rice cereal/almonds. Stir to combine completely, making sure to coat all of the cereal. While the bars firm up, place the chopped dark chocolate and almond butter in a microwave safe bowl and microwave in 30 seconds increments, stirring between each, until it’s smooth and melted. 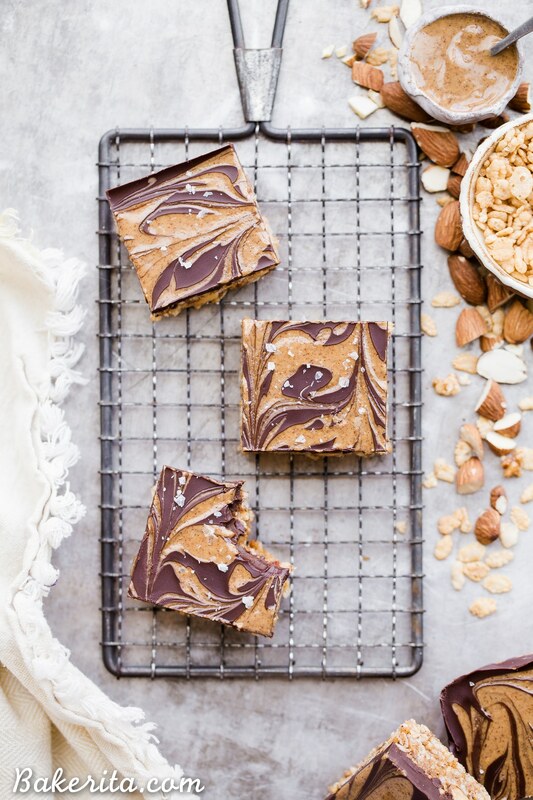 Spread the chocolate over the peanut butter crispy bars. In another small microwavable bowl, combine the almond butter and coconut oil and heat until the coconut oil is melted. Stir to combine, and then dollop over the melted chocolate. Use a knife to swirl the chocolate and almond butter together. Garnish with flaky sea salt, if desired. Let firm up in the fridge for at least 1 hour before cutting into 16 squares. Be sure to use a SHARP knife and cut them while they're cool or they'll crumble. Store in the refrigerator or freezer. Can’t get over that beautiful swirl on top! Presentation is on point! :) Plus I love no-bake desserts for summer! Thank you so much for the love Brittany! Aren’t no bake treats the best?? Also, where do you find brown rice crisps? I have a difficult time finding those. Hi! Can you use other nut butters in place of the almond butter?? Such pretty bars, I love that swirl! amazing1 can you write the macros of your upcoming recipes. it would be helpful. Hi Aaesha, I don’t count macros or calories, but sometimes I do include them when I remember. You can always calculate them yourself on myfitnesspal.com. YUM! So easy and SO delicious! I could only find dark chocolate brown rice puffs, which only added to the delicious chocolate flavor! And, I ran out of almond butter halfway through this recipe! So, I subbed peanut butter. Literally the easiest and most delicious dessert I’ve made in a while. Stashing this recipe in my go-to folder! The taste was still really good tho! !